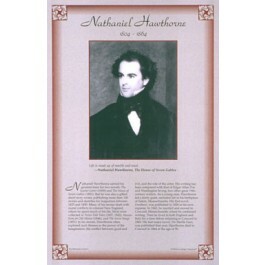 This unique educational poster features an artist's rendering of the great 19th century American author, Nathaniel Hawthorne, as well as a quote from "The House of Seven Gables," and concise biographical text summarizing his life and career. 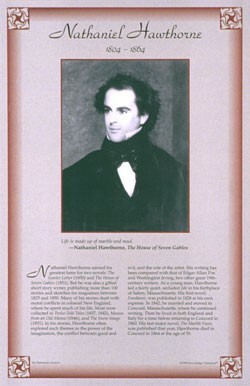 Nathaniel Hawthorne earned his fame for two novels "The House of Seven Gables," and "The Scarlet Letter," the latter known as his greatest work and one of America's greatest novels. This poster is a great way to introduce students to this classic American author.